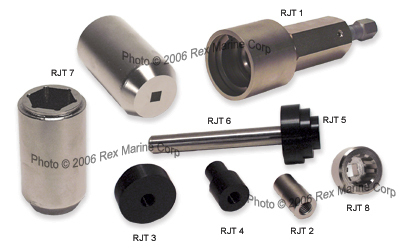 Rex Marine manufactured Jet Pump Tools - Don’t break your old impeller with an automotive puller, get the right tools. Our puller, drivers, impeller nut wrench & shaft spline wrench make the job of rebuilding a jet pump much simpler. Our tools work an Berkeley Jet Drives, American Turbine, Dominator, and others. Our Berkeley Jet Drive Tools and American Turbine Jet Pump Tools are the standard of the industry used by many OE Manufacturers.